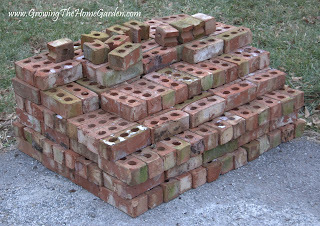 Today I picked up nearly 300 bricks for use in the greenhouse floor. Bricks are a good choice for flooring since they are solid yet can allow water to flow through the cracks. They will also help to absorb heat during the day and release it at night when the temperatures are cooler which is just what you want in a greenhouse! And to make it all even better I found them in a listing on Craigslist for free. There are 299 bricks with a few broken pieces here and there. They measure about 3"x8" on the flat side and should fill about 50 square feet of the greenhouse. I'll still need more bricks or paving stones to completely cover the greenhouse floor but this is a very good start! The person who gave me the bricks was trying to clear the lot of a house for sale. It's a very nice house in the Nolensville area with a dry creek bed in back and a lot of gardening potential! If you happen to be looking for a new house in that area let me know and I'll send your email onward to the owner! Thanks for sharing your progress. I bookmarked your blog so I can add it to a special link for other new Greenhouse owners to be inspired by. WOnderful to have made the Greenhouse COnnection with ya! What a great find Dave...I hope you can find the rest that you need for the same price as these, lol. I'm excited for the bricks but it sounds like you have a pretty good floor going! Thanks hopefully I can but I have some other ideas that I might be able to do if I can't find enough. I definitely can't complain about the price! That brick oven sounds like a neat project. Planning for some outdoor pizza? Hopefully the passive heat will be enough once February hits. I'll know better after I get the structure sealed up. It is staying about 5-10 degrees warmer than the outside temperature right now but it leaks like a sieve since the windows are not all completely closed. Brick are perfect for a greenhouse floor. It's going to look great. P.S. Start a list-never too late and it's easy with an excel spreadsheet.